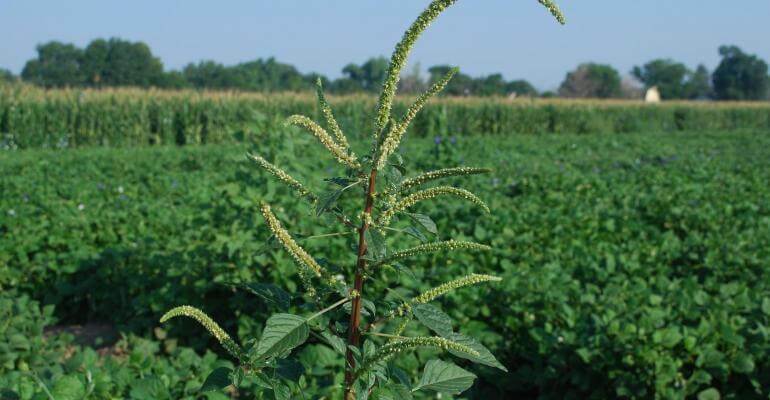 Earlier this spring, researchers at Kansas State University released new findings on the evolution of glyphosate resistance in Palmer amaranth (pigweed) that are really interesting in their own right, but also for a general reminder about how evolution works. And for what they might tell us about staving off herbicide resistance in invasive weeds. Before we get to the new science, let’s cover some old science. There is a free floating sense that herbicide resistance evolves via random useful mutations that happen after the application of herbicide and then natural selection kicks in. While not impossible, that’s not generally what’s going on. What’s happening is that the weeds start selecting for a trait they already have, expressing it in greater degrees as it starts conferring new found Darwinian fitness. There is evidence that individual weeds resistant to herbicides existed long before we even discovered synthetic herbicides. French researchers screened herbarium specimens for a weed called blackgrass (Alopecurus myosuroides). They then tested those blackgrass specimens to see if any of them carried genetic mutations known to confer resistance to a certain type of herbicide (ACCase inhibitors). They found a mutant collected in 1888 near Bordeaux, France and kept at the Montpellier herbarium that had the same kind of mutation that causes herbicide resistance in blackgrass today. The study was published in PLOS ONE in 2013. Although it is a really cool study, it isn’t actually surprising based on what we currently know about herbicide resistance. 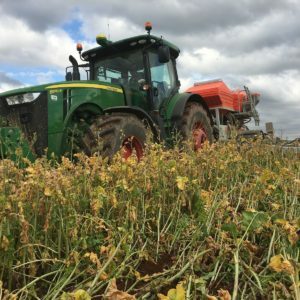 Weed scientists have long suspected that spraying herbicides doesn’t cause resistance mutations to occur in the plant; it simply removes all of the susceptible plants so that any plants that are resistant can grow and survive. Over time, continued use of the herbicide selects for the resistant plants to become more common, and to eventually dominate the field. 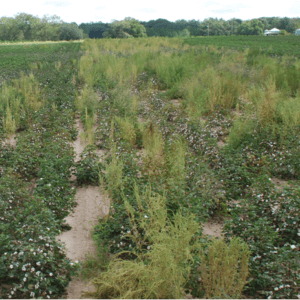 Herbicide use selects for the resistant plants that occur naturally within a weed population. So, now that we’ve all updated our mental model of how herbicide resistance develops in weeds, let’s take a look at the particularly dramatic version of this that the Kansas team found. It’s worth unpacking this process a bit more, just because it’s really interesting. 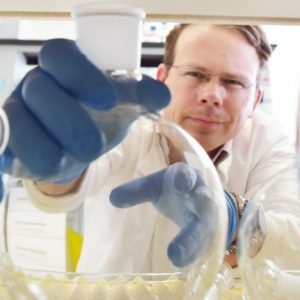 Living organisms, including plants and insects, have also evolved resistance to xenobiotics compounds, such as herbicides and insecticides, via gene amplification. In all reported studies, amplified gene copies were located in specific chromosomes or multiple chromosomal regions, but not in the form of eccDNAs. Therefore, gene amplification in these living organisms is thought to have occurred by chromosomal rearrangements, such as inversion and reciprocal exchanges, or in association with transposable elements. A 40-fold to >100-fold amplification of the 5-enolpyruvylshikimate-3-phosphate synthase (EPSPS) gene is associated with glyphosate resistance in Amaranthus palmeri populations. Initial reports suggested that the EPSPS amplicon was at least 30 kb in length and contained miniature inverted-repeat transposable elements (MITEs), which were postulated to disperse the amplicon to all of the glyphosate-resistant (GR) A. palmeri chromosomes at multiple sites (23, 31). More recently, the length of the EPSPS amplicon was extended to 297 kb, and termed the “EPSPS cassette,” by sequencing overlapping large-insert clones derived from a bacterial artificial chromosome (BAC) library. These clones flank the EPSPS gene, which was unique to GR A. palmeri across the United States, suggesting a single origin. 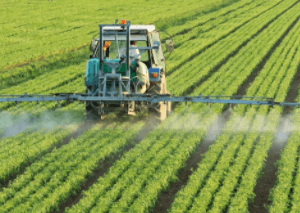 Here’s what’s going on: Glyphosate use creates stress that triggers extrachromosomal circular DNA-based amplification of the gene for the metabolic enzyme enolpyruvylshikimate-3-phosphate synthase (EPSPS) which glyphosate inhibits. Resistance isn’t a function of sidestepping the inhibition of EPSPS production, which is how the RoundUp Ready trait works. RoundUp Ready crops are tolerant of glyphosate because they produce a different version of EPSPS with a different gene than the one glyphosate targets. 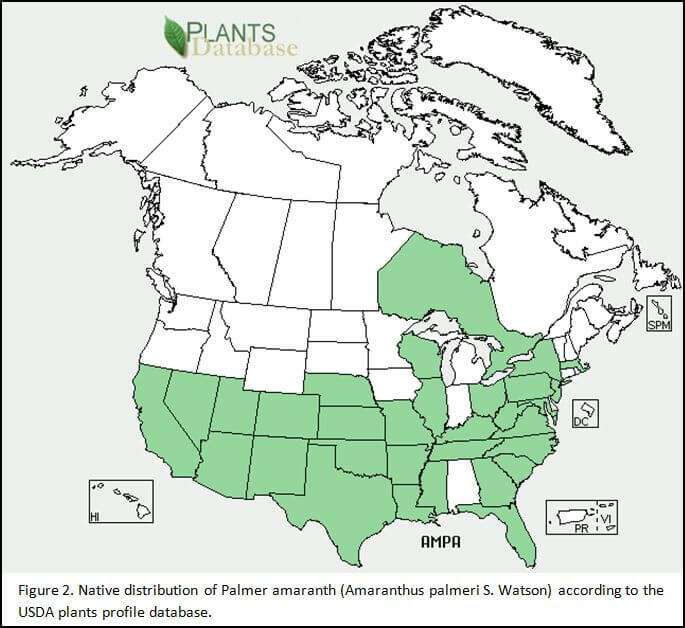 In Palmer amaranth, what we see instead is the DNA replicating so many of the genes for EPSPS through eccDNA that the plant cells produce more of them than the glyphosate can overwhelm. Plant responds to stress with eccDNA, resulting in multiple replications of genes. That process increases the chances of producing an adaptation that increases fitness for the plant. Those new replications that prove adaptive become sticky in the genome, those that don’t select back out. Once the replication of many multiples of the EPSPS gene are produced, resistance isn’t going anywhere soon. If you can remove evolutionary pressure for over-production of EPSPS before it gets out of hand, those copies might select back out. It seems to me that there is good news bound up with the bad news. The bad news (and it may not seem like “news” to farmers who’ve seen resistance develop with lightning speed in pigweed) is that resistance in this case doesn’t develop linearly, over time. Once the mechanism switches on, it develops really fast. The good news is that you’ve got a window where the resistance has no stable foundation and you’ve got a chance to select it back out if you act fast. Marc Brazeau is a frequent contributor to the GLP. He also is the editor of Food and Farm Discussion Lab. Follow him on Twitter @eatcookwrite.